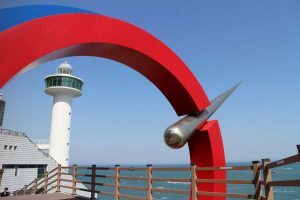 Set on a steep hill on the outskirts of Busan, this was a poor village until an art project revitalized this community in 2009. Artists began to paint murals and add street art throughout the maze of alleyways. 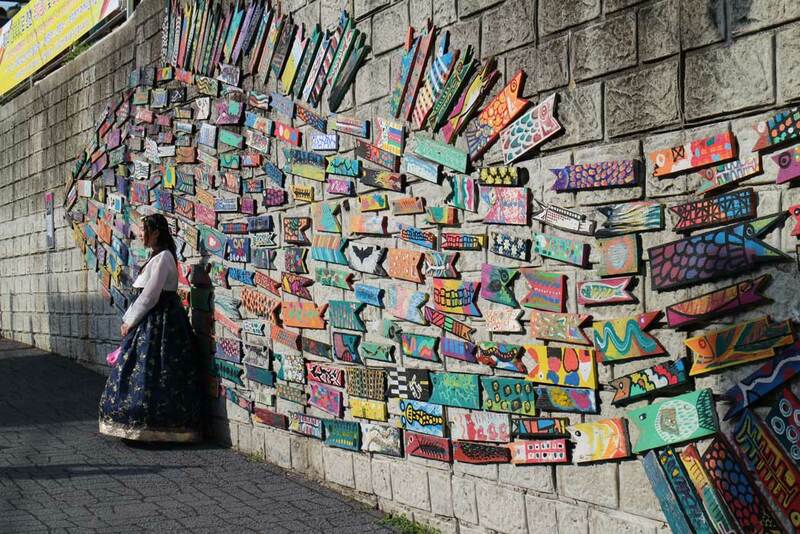 Now the community is a living art piece and a draw for tourists to explore. Located slightly north of the city on the edge of Geumjeongsan Mountain, this has been a religious site for over 1300 years. 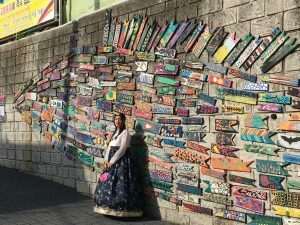 Beomeosa represents some of the best of Korean traditional architecture and even offers overnight temple stays. Nearby mountain springs, pine forests, and a grove of wisteria aid contemplation of one’s place in the natural world, giving a sense of peaceful calm. A haven for swimmers during warm months; even off season this beach is great to visit. Extending from the sand is a large elevated walkway over the ocean to get snapshots of the lighthouse in the harbor and to see the clear blue water below. 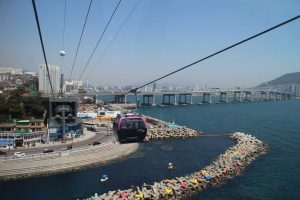 Flying overhead is a cable car affording amazing views of both sea and city that ends at Amnam Park – a protected forest reserve overlooking rocky cliffs on the water. A stunning seaside natural park of rocky cliffs, evergreen trees, a lighthouse, and an observatory overlooking the ocean. Visitors can enjoy a walk through the hilly park, or ride on a tram which stops at several areas. From the dining deck of the observatory, one could spend hours watching fishing boats and gazing over the rocky crags jutting from the water. The lighthouse also offers some iconic photos. 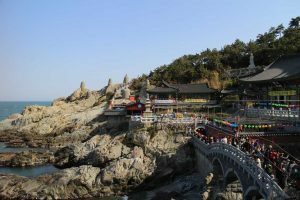 Unusually, this famous temple is built along the seaside and was constructed centuries ago to alleviate a drought. This place is popular with locals and foreigners alike, as there is a large statue of the Goddess of Mercy who is rumored by worshippers to bring success, as well as a large Buddha that is said to cure physical and mental illness. It is also worthwhile to visit the vendors on the walk down to the temple, as they offer an impressive array of delicious foods to try. This is a lovely spot for hikers in amazing pine forest. 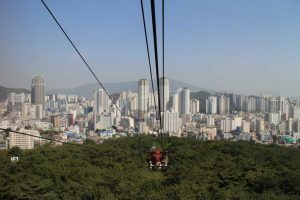 From the bottom, a cable car affords scenic views over Busan on a ride up to a clearing popular with locals for weekend picnics. 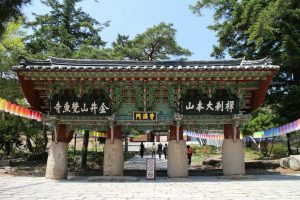 From here, treks around the park are possible; visiting ancient Geumjeong fortress gates and secluded temples. 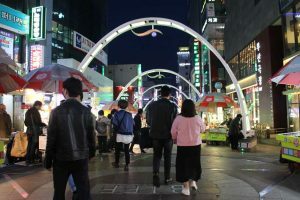 This area has been renovated to commemorate the world-famous Busan International Film Festival. Handprints of visiting stars have been immortalized in bronze in the pavement. Lining the walkways are many street food stalls catering to a variety of tastes. This is great way to sample Korean food! 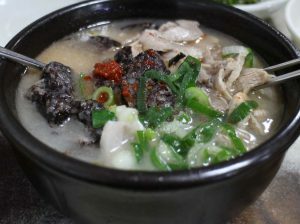 While the name is a mouthful, the rice soup with slices of pork, dipping sauces, and side dishes of vegetables are very satisfying. This restaurant is famous with locals and tourists alike, and prices are very affordable, so beware of potential queues. The proprietor also speaks English to help explain how best to eat it. 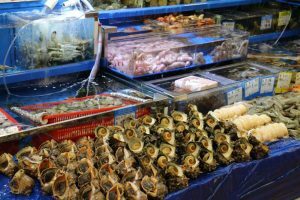 The ground floor is a huge fresh fish market offering an exotic array of seafood; such as huge crabs, fish, octopus, anemones, eels, clams, and marine worms. Vendors are happy to prepare them on the spot for you. Upstairs restaurants also offer fish options, some so fresh they are served squirming on your plate! Opening directly onto Hauendae beach, families will really love the convenient access. 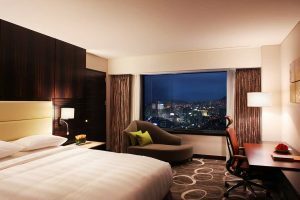 Nearby, is the Sea Life Busan Aquariam, and a plethora of restaurants to satisfy all tastes. Service standards are well up to Novotel levels and most of the rooms even have sea views. 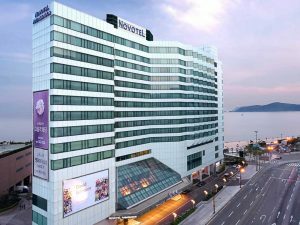 Perfectly located for families or business travelers in downtown Busan, this hotel offers great views of the city. With four international restaurants, a lounge bar, and a bakery, guests can enjoy many tastes from the comfort of the hotel! 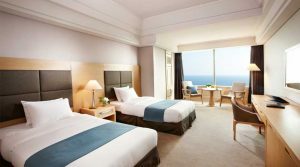 This hotel, situated near beautiful Haeundae Beach, contains full service amenities for any beach break, while also near the Busan Metro for easy access to cultural sites and shopping. Excellent staff are eager to assist in making your stay as pleasant as possible. Be sure to request an ocean view room to get the best views.